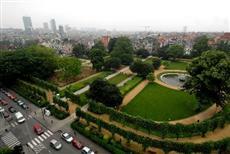 The B Aparthotels Ambiorix is perfectly located for both business and leisure guests to Brussels. All hotel's guestrooms have all the conveniences expected in a hotel in its class to suit guests' utmost comforts. Each guestroom has non smoking rooms, air conditioning, daily newspaper, desk, hair dryer, ironing board. This beautiful Brussels accommodation provides elevator, laundry service/dry cleaning, meeting facilities , safety deposit boxes, disabled facilities to suit all guests' utmost convenience. The hotel offers sauna to provide extra pleasure and relaxation for all guests. Along with its convenient location in Brussels, the hotel also offers a wide range of services and facilities to the guests. For your reservation at the B Aparthotels Ambiorix Brussels, please select your dates of stay and fill in our secure online booking form.